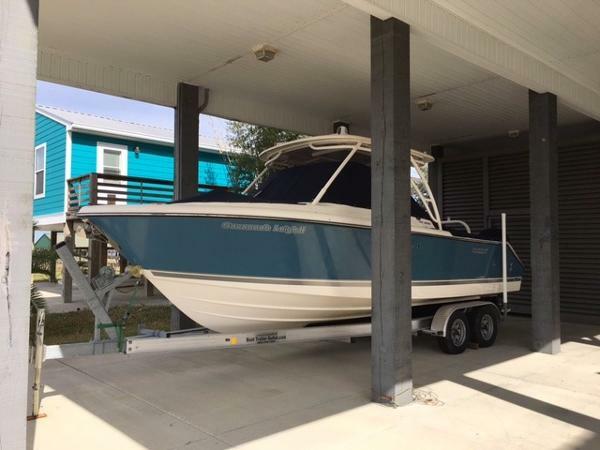 2002 Pursuit 3800 Express This boat has fished the last two summers out of Venice, LA with great success. 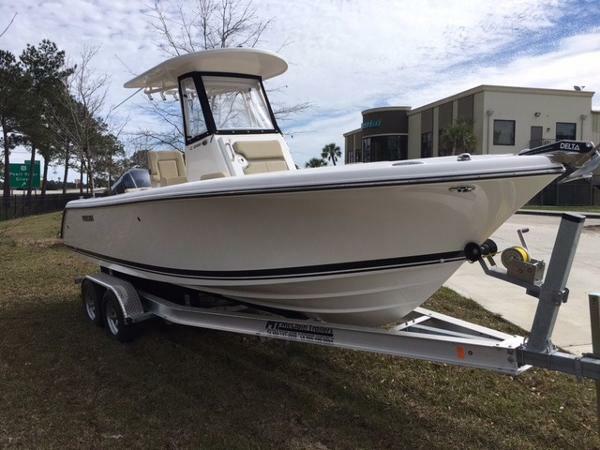 She's recently been upgraded with new equipment: GARMIN 5212, (2) ICOMS VHF, remote control spotlight, dripless shaft log, bridge A/C, "kickass" stereo system, life raft with mount, and 1,000 hrs engine serviced, plus many more! 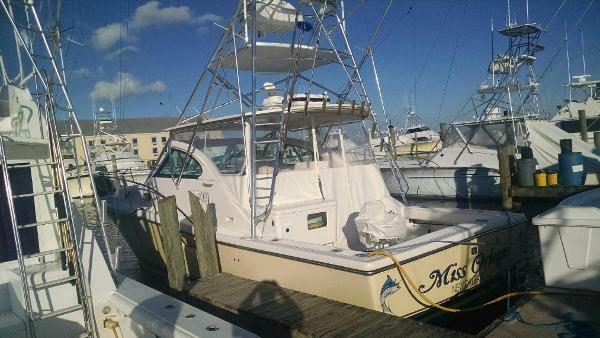 MISS ORLEANS is well rigged and has the VOLVO ENGINE upgrade plus the stand up rod locker storage. She is VERY ECONOMICAL to run. Seller moving to Hawaii to fish different waters. 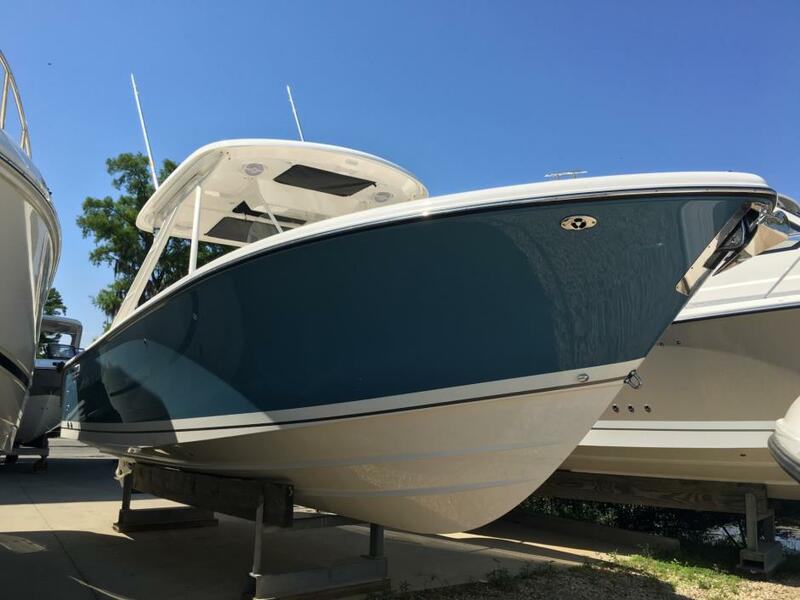 2016 Pursuit 280 Sport The S 280 features stunning good looks combined with exceptional handling and performance. Its long list of standard features includes rich teak accents, a fiberglass hardtop with a white powder coated aluminum frame, an overhead electronics box, an overhead storage bag, integral overhead interior lighting, three spreader lights, stereo, and four stereo speakers. Even front and side helm canvas curtains are standard for a dry, comfortable ride even in inclement weather.The helm features a split leaning post with flip up helm and companion bolsters and fixed arm rests for comfortable operation from a seated or standing position. For one of the most comfortable rides on the boat, deploy the folding aft stern seat, sit back and hold on. Strategically-placed cushions provide lumbar support while you're seated and function as essential coaming pads when the seat is not in use and folded flush. The console affords lockable storage and conceals a head compartment with holding tank, pump out and macerator.Other creature comforts include an Isotherm stainless steel drawer refrigerator and a molded-in 140-quart combination cooler/cushioned stern bench to keep your food and beverages cool and easily accessible. 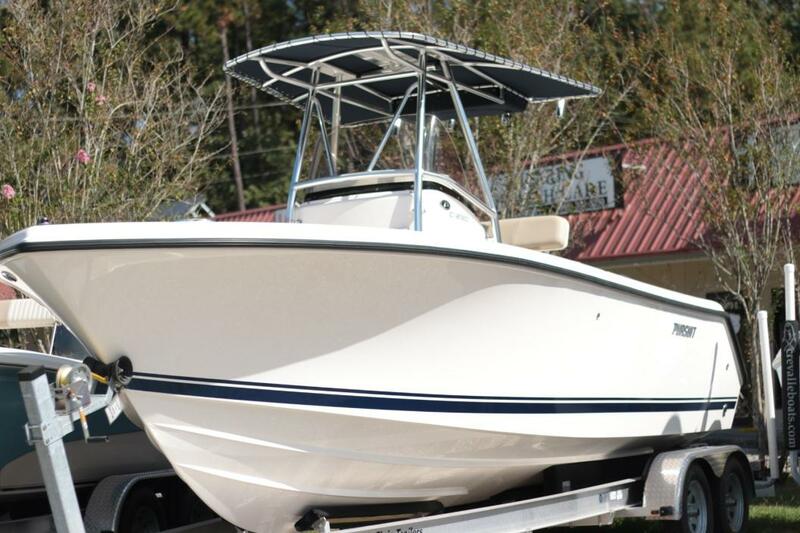 Twin 29-gallon insulated in-deck lockers with pump out serve to stow your catch or function as spacious storage compartments to keep the deck clear of gear. 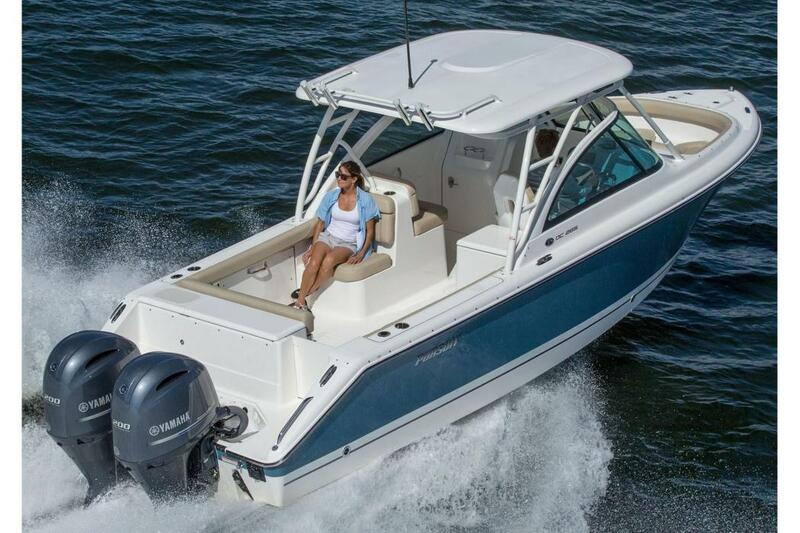 The molded-in split-bow seating area of the S 280 Sport affords additional seating for relaxing or entertaining and provides lockable rod storage, complete with padded reel protectors. The large raised foredeck area features an aggressive non-skid surface for more secure footing while you are boarding or cast netting from the bow. 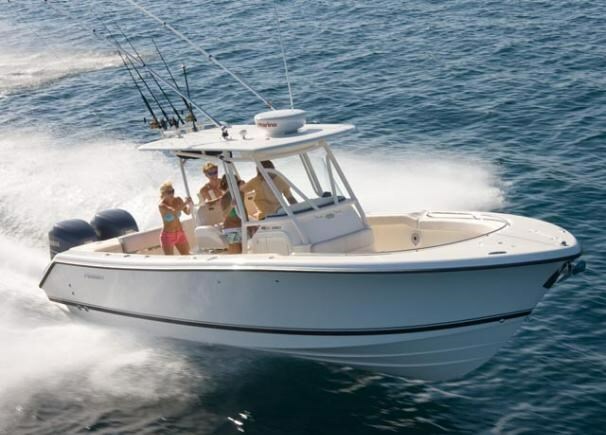 Other fish fighting features include a tackle center with removable trays, an insulated 45-gallon transom fish box and an optional 45-gallon recirculating livewell.For other watersports enthusiasts, there's a convenient transom gate and telescoping stainless steel ladder for water access. There's even a freshwater cockpit sprayer so you can rinse yourself off and clean your equipment before climbing back on board. 2015 Pursuit C 230 Center Console No hassles doesnt mean no frills when it comes to the versatile C 230. 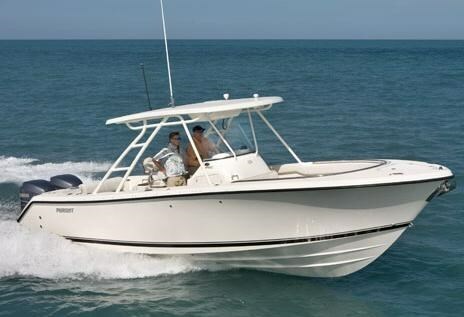 Despite her trailerable size, this boat packs a lot of amenities for fishing, cruising and watersports enthusiasts. The integral transom bench seat simultaneously provides comfortable seating while the seat base houses a 22-gallon storage compartment. 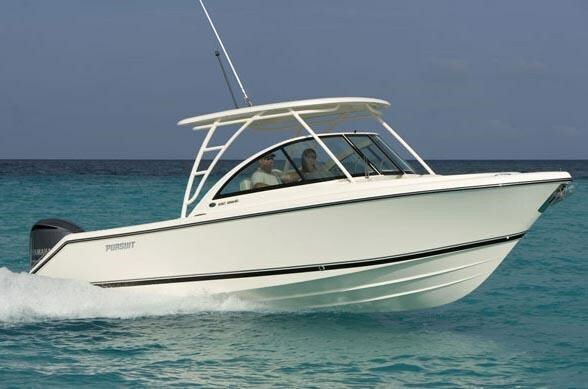 To port is a 23-gallon recirculating livewell with a rigging station located at the transom to starboard. A removable cooler can tuck easily under the leaning post but its not really necessary considering the expansive insulated cooler in the molded-in forward console seat base. Theres a portable head with pumpout in the console and even a washdown with hose and sprayer in the cockpit for quick clean up or to cool off on a scorching day. Efficiency is the name of the game with the C 230 in term of use of space and minimal maintenance and clean up after a full day. Also, consider the fuel efficiency afforded by the single, economical Yamaha four-stroke engine. The C 230 packs a lot of punch.